Finished Chapter 1 of this re-read: The introduction to the story doesn't lead you in gently at all. 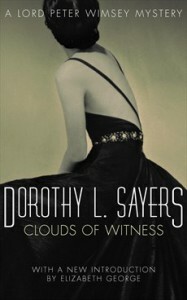 After a couple of pages with Wimsey and Bunter, we're right in the middle of the initial inquest. Some of the statements are showing the story's age, which is not something I noticed much on the last read. "In the kind of society to which the persons involved in this inquiry belonged, such a misdemeanour as cheating at cards was regarded as far more shameful than such sins as murder and adultery. Possibly the mere suggestion of such a thing, whether well-founded or not, might well cause a gentleman of sensitive honour to make away with himself. But was deceased honourable? Deceased had been educated in France, and French notions of the honest thing were very different from British ones. The Coroner himself had had business relations with French persons in his capacity as a solicitor, and could assure such of the jury as had never been in France that they ought to allow for these different standards." And yet, we know this is representative of the age but not representative of the main characters, so in a way it is Sayers showing up a mirror to her own time perhaps, too? I guess this is where one book leads to another again, as the Sayers bio on my kindle my move up the TBR after this book.